AI has the power to bridge the gap between clicks and bricks if we use it wisely. Joanne Jong explores the role of Artificial Intelligence in fashion. The question is, while the customer journey continues to be profiled and processed, how can we harness the power of Artificial Intelligence in fashion and bridge the gap between clicks and bricks? E-commerce giants, Alibaba Group believe they are on the right track. They are the brains behind a new Guess AI concept store, which is currently being showcased at Hong Kong Polytechnic University. Shoppers can ‘check in’ to the Guess apparel store using a mobile code or use face ID for a more personalised experience. 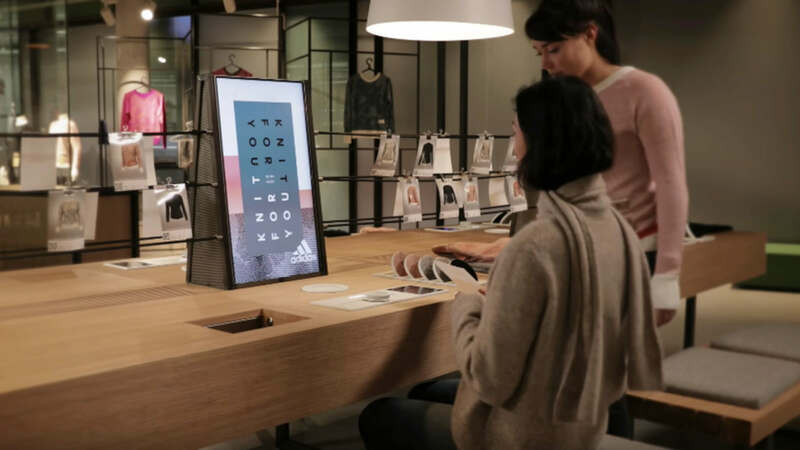 When shoppers select items, these automatically show up on a smart mirror with product details and mix and match options. Shoppers are even directed to where suggested items are located instore and can update their sizing preferences in the changing room which are then hand-delivered by staff. Fast fashion retailer, Zara is also at the forefront of the AI journey. The high-street giant is planning to slow down its physical growth and instead focus on omnichannel experiences. Hot on the heels of Zara’s first ever pop-up store, which allowed customers to use a virtual styling tool embedded in changing room mirrors, Zara recently launched a new future-focused flagship at Westfield. The 50,000 sq. ft store uses the most advanced technology and allows customers to pay for goods via Bluetooth or pick up same-day-orders using automated pick-up booths. There’s more. By downloading the Zara AR app, shoppers can point their phone at Zara shop windows and be greeted with a virtual catwalk showcasing the current collection. Items can then be purchased through the app or in-store. We’re seeing a huge increase in the number of bots being utilised to create a seamless, enhanced experience where the customer no longer has to think and is guided by a virtual assistant. Alexa and Siri are prime examples of this, but in terms of fashion, Levi’s have seen increases in sales through their Virtual Stylist chatbot. Using Facebook Messenger or the direct website, shoppers communicate with a Virtual Stylist who assists them in their search for the perfect pair of jeans. The bot guides the user through fit, stretch and style, presenting them with the best selection. Shoppers can even share their buying options with friends who can vote for their favourite garments ahead of purchase. Companies such as Amazon are thinking even bigger and trying to streamline the fit process across the board. Amazon recently acquired Body Labs which can be used to “accurately predict and measure the 3D shape of your customers using just a single image.” However, this is easier said than done as all brands differ slightly in their sizing and fit. For example, a pair of Uniqlo jeans would have a very different from H&M, even if they appeared to be very similar styles. Although electric sewing machines have been in use for over a century, they have always needed experienced human hands to guide the material. Now robotic machine technologies are emerging which reduce the need for human interaction at all. The Mohammadi Group which manufactures jumpers for big names such as H&M and Zara have replaced over 500 workers with automated ‘sewbots’ which do the work for them. Adidas also recently opened shoe production plants in Germany which use computerised-knitting technology instead of labourers. This is positive news for developed countries but presents a worrying problem for places such as Bangladesh where textile and fashion production makes up a large part of their countries trade. What does the future of AI fashion hold? I predict that one-day standardised fit sizes for the mass market will be a thing of the past. Customisation at scale will become the norm, as we will shop for clothes made to fit our individual and unique body avatar. We will have an assistant that curates and shops our wardrobe for us and even delivers it to the door. The bot will be able to alert the supplier on what is being kept or returned and organise delivery. It will be our very own personal shopper. Although artificial intelligence is often perceived as spooky, it’s a great guiding tool to identify what customers really want. Designing to a brief has always been de rigueur, the difference is that today’s brief is based on hard data rather than guesswork. Technology has the power to revolutionise the way we shop, but we’ll always need human intuition and creativity to harness it.